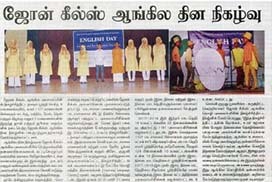 John Keells Foundation organized an awareness session on preventing gender-based violence for the women’s societies of Iranaipalai and Puthumathalan of the Mullaitivu District in the lead up to International Women’s Day. The session was organized as part of John Keells Foundation’s Project WAVE – a long term initiative aimed at combatting gender based violence and child abuse through education and awareness creation comprising employees of the Group, strategic communities and the general public. The session was conducted by two external gender trainers, Kumari Idamegama and V Weerasingham on 4th March 2019 at Puthumathalan Community Centre with the participation of 35 women.The programme was well- received by the participants and the success of the session was apparent through the active participation of the audience. The 26th edition of – Kala Pola – Sri Lanka’s renowned open-air art fair of visual art – was held on Sunday, 24th February 2019 along Ananda Coomaraswamy Mawatha in Colombo 07. Presented by The George Keyt Foundation (GKF) in partnership with John Keells Holdings PLC, this year marked the 25th anniversary of the JKH’s continuous sponsorship of the event. The event saw the participation of 357 artists and sculptors from various parts of Sri Lanka generating sales of approximately 17.5 million and drawing over 31,000 visitors comprising both local and foreign, adults and children. The Children’s Art Corner conducted at the Public Library drew 235 kids who engaged in painting and clay work under the guidance of teachers of the Cora Abraham School. 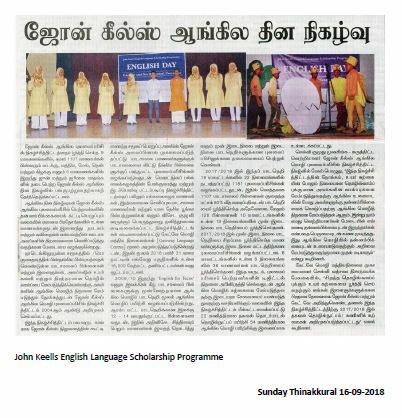 107 John Keells volunteers supported Kala Pola 2019 in various capacities. Focused on showcasing and promoting Sri Lankan art, Kala Pola has primarily functioned as a platform for painters and sculptors of all kinds to showcase their work. It also provides lucrative opportunities and networking possibilities among artists and an ever-appreciative audience that has been bourgeoning over the years. Kala Pola has served as a launch pad for many local artists to gain recognition and propel their work into the international arena. The official ceremony took place at 5 pm under the patronage of the Acting High Commissioner of Bangladesh in Sri Lanka, Mr. Mohammad Hazrat Ali Khan and Mrs. Ali Khan, Chairman and Trustees of GKF and Chairman and Directors of the John Keells Group. Celebrations also included cultural entertainment towards late evening. John Keells Foundation conducted a successful public transport campaign on 26th November 2018 to coincide with the International Day for the Elimination of Violence Against Women, for the third successive year. This year’s campaign targeted bus commuters within the Colombo City limits through a sticker and leaflet campaign with the approval and cooperation of both the Sri Lanka Transport Board and Western Province Provincial Road Passenger Transport Authority. Teams of volunteers from the John Keells Group carried out the campaign at the busiest bus depots in Colombo – SLTB’s Pettah Central Bus Complex and the Borella Bus Depot as well as the private bus terminals in Bastian Mawatha and Gunasinghepura throughout the day to create awareness. This year’s campaign was carried out under the theme ‘See it, Report it, Prevent it’ encouraging all to report sexual harassment when they see in order to prevent it. The campaign raised awareness on the National Transport Commission hotline 1955, police hotlines 119 / 011 2 444 444 and the related app developed by Women In Need (WIN). Under the campaign 1500 stickers in Sinhala and Tamil were pasted while approximately 28,000 information cards were distributed amongst commuters by 75 staff volunteers. The campaign is estimated to have reached of over 100,000 commuters. The public campaign was complemented by an internal poster campaign covering all businesses of the John Keells Group including customer interfaces. John Keells Foundation in collaboration with the Alumni Association of the Management Faculty organized a Soft Skills Workshop at the Sabaragamuwa University on 19th October 2018 at the University’s Social sciences Auditorium. A total of 617 students attended the workshops with 525 students completing the programme with 100% attendance. The workshop commenced with a panel discussion on ‘Employer Expectations’ and ‘Team Building & Leadership Skills. The panelists comprised of Vindya Cooray – Sector Financial Controller of the Leisure Inbound Sector, Rangika Abeynayake – Head of HR processes and Systems, John Keells Group, Eranga Ginige – Founder of Social Enterprise Lanka and Sriyangani Dhanapala – Assistant Manager, Brand Marketing Cinnamon Hotels and Resorts. This was followed by workshops on Social Etiquette, Personality Development & Confidence Building and Facing interviews & CV writing by both Professional and staff Volunteer Trainers. The programme was completed successfully enabling many participants to reflect on their future career path in greater depth and understand what they need to do to get there. As the targeted audience were final year management students, mock interviews too were conducted for the students to be better prepared for the interviews they are to face in the future. The annual Career Guidance programme was conducted on the 17th of October 2018 at the Kichilan Reception Hall in Wekanada Colombo 2. The programme comprised of sessions on personal effectiveness and leadership, overview on career prospects and vocational training opportunities and essentials on self-enterprise conducted by V.Poobalasingam. 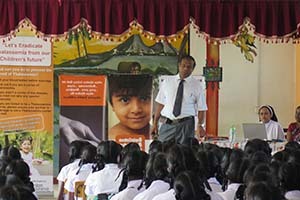 Lasantha Ranathunga from Cinnamon Lakeside conducted a session on Personal Grooming and Hygiene. This was followed by a practical demonstration on dining etiquette conducted by Dinusha Harshana from the Cinnamon red Learning and development department with the assistance of one of the participants.The next session comprised of presentations on career and growth opportunities in the Leisure Retails and Property Sectors of the Group. This was conducted by the learning and development departments of Cinnamon RED, Cinnamon Lakeside and Jay Kay Marketing Services. The programme was open to Grade 11 students from the 5 schools supported under the John Keells Neighbourhood School Development Project. A total of 85 students were in attendance. Coordinated with support from school principals and Group businesses, the Career Guidance Programme aims to provide relevant skills and knowledge to successfully enter the workforce as well as highlight opportunities provided by John Keells to youth who are not eligible to pursue Advanced Level studies. Banuka Dhananjaya, a vocational trainee currently working at Cinnamon Red was also present to share his experience and encourage others to apply for this work experience and skills development programme. Extended support and collaborative efforts received from National Thalassemia Centre – Kurunegala along with the Hemal’s Adolescent & Adult Thalassemia Care has made it possible to conduct the awareness sessions across the country. Diabetes was seen as a critical area of concern and was taken under the strategic focus of UA’s CSR platform. 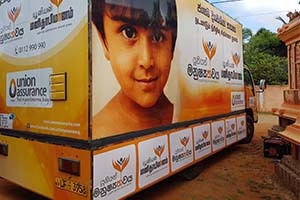 Through Union Manushyathwaya, interventions were developed, focusing on pre-screening models. This was brought into action with the collaborative effort of Public Health Department of the CMC, DMOH offices and NCD (Non-Communicable Disease) Units.